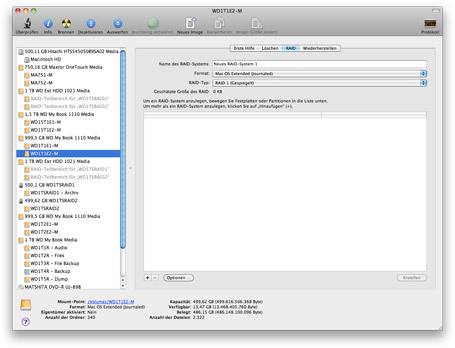 With the OS X Disk Utility it is very easy to manage your different hard disks. It also allows you to create a software RAID in the modes 0 ( striping ) and 1 ( mirroring ). In most cases you don’t want the complete hard drive to be part of the RAID but want to seperate the disk into multiple partitions. To create those multiple partitions each in a RAID you could use the following steps. Create all partitions on each of the hard drives. So two partitions on the first hard drive and two partitions of the same size on the second drive. Mark the first partition on the first drive and press the RAID button to start the creation of the first RAID. Drap and Drop both partitions into the RAID list in the middle. Give it a name, select the RAID type and the filesystem format. After the creation of the first RAID is complete, unmount the new RAID disk in the Disk Utility. The used disk partitions should now be grey and should not allow further actions. When i didn’t unmount the RAID disk i still got an POSIX error – Disk still in use. Do the same steps for the second RAID combination. After the second RAID is completed mount the first RAID system again. If one drive fails, do you know how easy/hard it is to rebuild these two raid sets? Can the first partitions of each drive be RAID 0 while the second partitions of each drive are RAID 1?